Takoma Park, or “Granola Park” as some locals call it now, was the first planned suburban community of Washington, DC. Founded in 1883, by Benjamin Franklin Gilbert, Takoma Park was developed along a branch of the B & O railroad. It was originally conceived as a “summer resort” area, as a healthful clean-water alternative to Washington, DC’s malarial swamps. With a population of 18,000 it rests along the upper northeast boundary of D.C. and strattles Montgomery and Prince Georges Counties in Maryland. 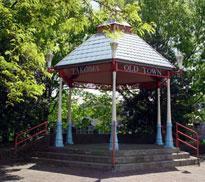 B.F. Gilbert named his community TAKOMA, an Indian word meaning “High Up – Near Heaven”. Takoma Park has it’s own city government, police department, library and is served by Montgomery County Schools. Religion and politics has shaped the Takoma Park community. From the early 1900’s to 1990, Takoma Park was the world headquarters of the Seventh-Day Adventist Church. Two of the church’s institutions remain today, The Washington Adventist Hospital, and Columbia Union College. The coming of metro service to Takoma Park has made it a perfect “bedroom community” for young professionals. It is a 15 minute commute to the middle of Downtown D.C. by Metro from the Takoma Station on the Red Line. Takoma Park is a friendly “laid back”, independent, small town with liberal politics. The residents are politically active and have put in place a number of progressive measures such as the declaration of a nuclear-free zone and legal recognition of non-marital partnerships. In the historic district you will find grand old Victorians, Bungalows, American Four Squares and other old timey styles, along tree-lined streets. The Old Town offers an eclectic, funky mix of small, locally owned specialty shops and small restaurants, cafes and a very popular FOOD COOP. From the end of April to mid December there is a farmers market every Sunday in the center of town. To celebrate July 4th, the town puts on its own parade and its own fireworks display. This entry was posted on Thursday, November 13th, 2008 at 2:46 pm	and is filed under silver spring real estate, Takoma Park Real Estate. You can follow any responses to this entry through the RSS 2.0 feed. You can skip to the end and leave a response. Pinging is currently not allowed.